Directed Ramjet Technology is a promising new fuel efficiency technology invented by Kenneth Burridge, that is based on advancing and applying Bernoulli’s Principles and aircraft design to new lowspeed (less than the speed of sound 600 MPH or less) aerodynamic applications, which could have major implications for Electric Vehicles and the transportation industry. Directed Ramjet Technology: A fuel efficiency advancement for electric vehicles. Directed Ramjet Technology is currently being developed privately with the goal to increase the fuel efficiency, range and/or reduce the energy required to propel a multitude of vehicles and products that operate in air or water. Without going into too much detail the basic design components can be incorporated into the basic structure of land and watercraft and creates additional relative airflow that can be redirected for propulsion and/or to provide additional electrical power while the object or vehicle is in motion. 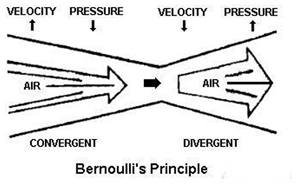 Multiple man-sized prototypes have already been created and validated using elements of this new technology that builds upon proven aerodynamic principles originally discovered by Bernoulli. In addition some of the concept elements have also been proven effective and are currently being utilized in the aviation industry today. Directed Ramjet Technology may very well become a game changer that would forever influence the design of Electric Cars and the look of transportation as we currently know it. The range extending technology could be applied to most any type of vehicle, however, it would be even more effective at significantly increasing the range of electric or creating a new types of hybrid electric vehicles. Directed Ramjet Technology is a Fuel Efficiency breakthrough that is currently in private development. Interested individuals and investors wishing to know more should contact Kenneth Burridge directly via his website or Facebook page. Mr Burridge is also working with another proven scientific principle that should be exploited to increase fuel efficiency that is being called Vibro Push/Wave Technology for lack of a better name. See Octane Holding Group to learn more about refuelling solutions. There are no current plans to use Kickstart or other public funding options for these projects.